This week was Severe Weather Awareness in Maryland, a time to review your emergency plans in case severe weather strikes. Tornadoes, lightning, and flooding are some of the most common natural disasters during the spring and summer months. While there are plenty of severe weather hazards, tornadoes seem to get the most attention. Tornadoes are the worlds most dangerous weather phenomenon and they do occur on Delmarva. Maryland averages 7 tornadoes per year, Virginia averages 11, and Delaware averages 1 per year. 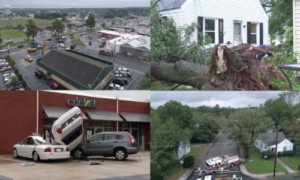 Remember the EF-1 tornado that struck Salisbury back on August 7, 2017 causing damage across the area? Luckily there were no deaths. Below is the official report from the National Weather Service in Wakefield, VA and a few pictures of the damage. The safest place to be if one is heading your way is a basement or storm shelter. If you don’t have any of those, then get to the lowest level of your house, in an interior room, away from windows, and cover your head. 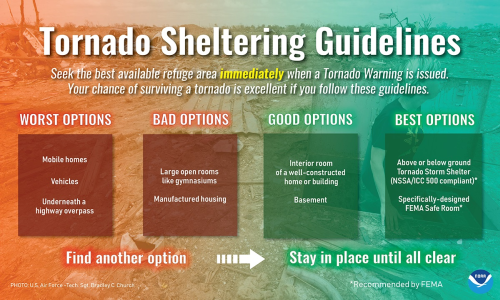 Attached below is a guideline for the safest places to be during a tornado. A common misunderstanding is the difference between a tornado warning and tornado watch. A tornado warning means the threat of a tornado is imminent (either a tornado is already on the ground or radar shows that one is very possible) and that you must take action immediately. A tornado watch means conditions are at least favorable for a tornado to form and that you should monitor the forecast. If you missed this weeks severe weather awareness in Maryland and you need more information or you just want some safety tips, you can head over to mema.maryland.gov. You can also check out this National Weather Service brochure at https://www.weather.gov/media/lwx/NEWebwBrochure2019.pdf. While Maryland had its awareness week this week, Delaware is next week. April 15-19 is Severe Weather Awareness Week in Delaware. The topics covered are flooding, hail, lightning, tornadoes, rip currents, and more. You can check it out at this link: https://www.weather.gov/phi/DEMASevereWxWeek. Now that severe weather season is officially here, be sure to review your action and safety plans. Also, consider running tornado drills so that you’re prepared in case the worst happens.